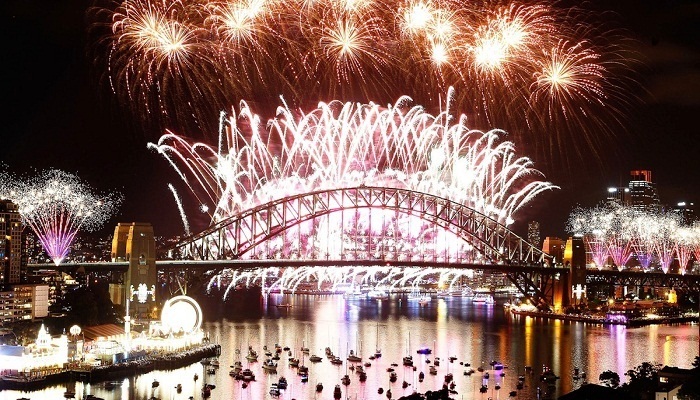 New Year Eve 2019 Live Sydney: Australia's largest city Sydney will put on its biggest-ever fireworks display to welcome the New Year and kick off a wave of celebrations for billions around the world. A record amount of pyrotechnics, as well as new fireworks effects and colours, will light up the harbour city's skyline for 12 minutes and dazzle the more than 1.5 million spectators expected to crowd foreshores and parks. "I'm sure we'll delight in seeing our beautiful harbour lit up like never before," Sydney Lord Mayor Clover Moore said. To mark the international year of indigenous languages in 2019, the harbour will host a ceremony celebrating the Aboriginal heritage that includes animations projected onto the Sydney Harbour Bridge's pylons. The party atmosphere will sweep across major cities in Asia, Europe, Africa and the Americas as the clock ticks past midnight. A strong police presence has become a key element of the festivities, to protect crowds that could be targeted in terror and vehicle attacks. Hong Kong: Glittering fireworks will be sent skyward from five barges floating in Victoria Harbour in a 10-minute display watching by 300,000 people on the foreshore. Tokyo: Japanese will flock to temples to ring in the New Year, while US boxer Floyd Mayweather Jr will take on local kickboxer Tenshin Nasukawa in a bout staged outside Tokyo. Moscow: Concerts and light shows will be held across the city's parks and more than 1,000 ice rinks have been opened for merrymakers.